Yea, so I am a liar. I say I am back in action, but than I am not. Oops. Perhaps some day I can redeem my honor and keep my word. 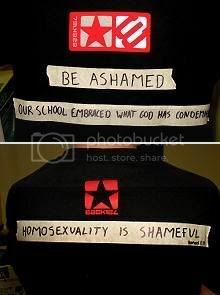 Remember Tyler Chase Harper and anti-gay T-Shirts? Harper is the blond teen ADF model/activist-in-training who sued the Poway School District because they wouldn’t let him wear an anti-gay T-shirt to school two days in a row. We’ve told you about him and his crusade before. wants to wear a shirt condemning her fellow students. Well, this time was no different than the last. The judge, again, said that giving students the ability to attend class without condemnation is within the rights of a school. And so poor Kelsie will also be disallowed from being able to amend the Day of Silence’s message of “We support all students” to include “except for the homos”. Of course it isn’t over. Because with each legal appeal comes a press release. And a chance for the ADF to make a financial appeal to protect our good Christian students from the homossseeeexxxxual agenda. I am going to bank on posting daily now. My busyness is subsiding as my graduate school applications are done! I finished up Yale and Duke’s divinity school applications today. I just need to wait now. And blog in the meantime. Come to Duke! Come to Duke! Come down to North Carolina!